The lady sitting across from me glances at her watch. It is ten past six. She takes a sip of tea and, relaxing into her chair, pulls out a book and starts to read. Everyone here is waiting. Waiting for their drinks – teas and hot chocolates and double shot skinny decaf lattes. Waiting for their friends coming off the train – from London, from Largs, from Linlithgow. Others, like me, are waiting for their trains home to come in. The coffee grinder crackles in the background, and there is the sound of clinking coffee cups and someone counting out change. I am sitting in the window seat of Costa Coffee in Central Station, trying to catch my breath after running for a train. I missed it by seconds, and now I have an hour to wait. I seem to spend a lot of my life waiting for things: for public transport, for lectures, for family members to come out the shower so I can brush my teeth. I think we, as a culture, don’t have much patience for waiting. It is stressful and it interrupts what we need to be doing. We are busy and inconvenience is something we just don’t have time for. We have pre-packed sandwiches, and mobile phones, and e-books to try cut it out of our lives. I check my phone: still forty five minutes to go. Time seems to be passing very slowly. I try and relax, taking off my jacket and sipping my gingerbread latte. There’s not much point in being agitated. I missed the train, there is nothing I can do apart from wait. On the surface, moments of waiting can feel like a waste of time. 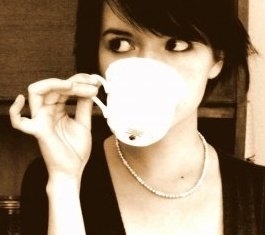 Sipping my coffee, I think that there is often meaning to be found in the midst of them though, if we look hard enough. Often it is in these moments where I’ve had a conversation that has changed the way I think about something, or an idea that I’ve been struggling with will settle and I’ll just suddenly, inexplicably, understand. My attention is drawn by a hoard of football fans that are standing near the window where I’m sitting. They have started singing, and I can hear the song through the glass: a bizarre medley of ‘Doe a Deer’ and ‘Yes, Jesus Loves Me’. One of them, a man caped in a Scottish flag, seems to be taking it a little bit too seriously. They bound past the window and are gone. I forget about all the things I need to be doing and get lost, just watching the people passing by. A young couple meander out of the station, fingers laced together. A girl wearing a hat with furry ears is leaning against the wall outside, talking on the phone. All of a sudden, a whole wave of people rolls past. They walk in unison, pressing close together so that their shoulders are nearly touching. And yet none of them look at each other. An old man is walking in the opposite direction. He takes slow steps, weaving in and out of the crowd, and he has a newspaper tucked under his arm. He is looking at his feet. I realise the only person who seems to actually look around is one little boy with a Spiderman backpack. His hand is tight in his mum’s, and he is lagging behind, staring up directly at the people surrounding him; his eyes are full of wonder, he is taking everything in and it’s almost beautiful to watch. The voice from the loud speaker mumbles something, and the crowd disappears. I check the time again. A jolt: I have less than three minutes until my train leaves! I grab my bag and run out the door. I find myself swept along in a new wave of people, leaving the waiting space behind. Posted in Features and tagged Column, public transport, reflecting, trains, waiting. Bookmark the permalink.